Kepler-35 b is a "twin-sun" planet that orbits its star in 131 days and at about 60% of the distance between the Earth and the Sun. This puts the world near its habitable zone. At 13% the mass of Jupiter, it is a gaseous body. Steve Vogt and Paul Butler, who lead the Lick-Carnegie Exoplanet Survey, have discovered planet "g" in the Gliese 581 system. This world, shown in the foreground, has a 37-day orbit, a mass three to four times that of Earth, and one side that perpetually faces its red dwarf star. Their compelling data suggests this may be the first potentially habitable planet found around a very nearby star. Planets e, b, and c, which orbit closer in, are shown in the distance. Vogt's personal name for Gliese 581 g is "Zarmina's World", after his wife. Astronomy Picture of the Day on October 1, 2010. If an advanced civilization exists upon Gliese 581 g, where would it be? Scientific models predict that while circular "eco-zones" exist on this world, there would be polar ice caps and also a large area of frozen tundra on the dark side. The substellar regions closest to the star would be extremely hot. Thus, the mostly likely location for such life is the line between light and shadow (called the "terminator") and in the proximity of the equator, as shown here by the lights. Discovered by the Geneva Extrasolar Search Program, Gliese 581 c, shown from the surface of a possible moon, is thought to be a rocky world about 1.5 times the radius of Earth. Its temperature is uncertain, yet it resides near the star's habitable zone. The existence of oceans and lakes is a possibility on the back side of the planet. This artwork was created for an event at swissnex San Francisco. Gregory Henry and Benjamin Zuckerman announced the presence of a huge ring of infrared-emitting dust encircling the mature, sun-like binary star BD+20 307. A collision of two terrestrial planets similar to Earth and Venus is the likely cause of this disk. Astronomy Picture of the Day on September 25, 2008. Three young planets, still glowing from contraction, orbit the star HR 8799 at about 130 light years from Earth. The first-ever direct images of a multi-planet system around a Sun-like star, on which this press release illustration is based, were taken by astronomers using the Gemini North telescope and W.M. Keck Observatory on Hawaii's Mauna Kea. A large amount of dust has been found orbiting the star HD 23514 in the Pleiades star cluster. 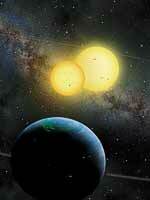 This suggests a collision of two Earth-sized bodies, as shown in this Gemini Observatory press release artwork. A small number of exoplanets have been detected by the gravitational microlensing technique. In these cases, each planet's gravitational field bends and focuses light from a star lined up behind it, much as the glass lens in a telescope bends and focuses starlight. Three examples are shown below. The first world discovered via microlensing, OGLE235-MOA53 b was found via a collaboration of the OGLE and MOA groups. It has 2.6 Jupiter masses, orbits a red dwarf star, and is located 17,000 light years away in the constellation Sagittarius. OGLE-05-169L b is 13 times Earth's mass and orbits a red dwarf in 3300 days. Its expected surface temperature suggests an icy nature, but it is uncertain whether this world would be terrestrial or gaseous. It is shown here as a sphere of icy rock with a thin atmosphere. Just 5.5 times the mass of Earth, this exoplanet has a 3500-day orbit around a red dwarf star with one-fifth of the Sun's mass. The result is a frigid -364 degrees Fahrenheit on this icy, terrestrial body. The N2K team, an international consortium of astronomers, found an unusual planet that transits the sun-like star HD149026. While it has a mass similar to Saturn's, it is smaller in diameter and has a different structure: a heavy core as big as 70 times the mass of the Earth and a thin atmosphere. This world orbits its star in just 2.87 days, and may be losing mass due to atmospheric outgassing. The oldest planet known to date orbits a binary system of a white dwarf and pulsar in the globular cluster M4. It is a gaseous world 3 billion years old and may be one of the earliest planets to have formed in the early universe. In this hypothetical scenario, a terrestrial planet ejected from the star disrupted the gas giant's satellite system, forcing a moon into a highly inclined orbit. From the surface of this barren moon, the aurora at the planet's pole can be seen, a phenomenon caused by the radiation and stellar winds coming from the binary stars. Epsilon Eridani, a star only 10.5 light-years away and visible near Orion's Belt, may have one Jupiter-like planet. A frozen lunar landscape shimmers at the bottom, in contrast to the hot volcanic moon closer in toward the planet's rings. In the distance glows the zodiacal light. The dust ring encircling Epsilon Eridani forms an arc at the top. Discoverers include Dr. William Cochran, Artie Hatzes, and Gordon Walker. PSR 1257+12 has four planets discovered by Alex Wolszczan. The first three, shown in this painting, were confirmed before any planets were discovered around sunlike stars. The pulsar's radiation regularly sweeps over the planet in the foreground, energizing its atmosphere, causing auroras, and bathing it in an eerie green light. The extreme radiation from a pulsar might excite ions on orbiting planets to the point of creating a bright blue glow and causing materials on the surface to fluoresce, just as minerals glow under black light. The excited ions also form a tail behind the distant planets. HD82943 is a solar-type star in the constellation Hydra. Two giant planets orbit this star. Garik Israelian and colleagues have found HD82943 to contain a significant amount of lithium-6, inferring that it swallowed one or more large planets during its history. Shown here are the star and infalling planet - which forms a comet-like tail as it crashes into the stellar atmosphere - from the vantage point of a moon orbiting a second planet. The outermost planet with 3 tiny satellites is seen in the distance at the upper left. iota Horologii b, found at the ESO La Silla Observatory, follows an Earth-like orbit around a young star. The planetary system is full of debris that bombards the planet. A hypothetical satellite, smaller than Earth and shown at the bottom, has not yet cooled and still has active volcanoes. Its horizon is curved. George Gatewood of the University of Pittsburgh may have discovered two Jupiter-like planets orbiting Lalande 21185. This is a red dwarf star just 8.25 light-years away. In this painting, the innermost planet can be seen just to the left of the red dwarf. The outer planet is at the top, with the landscape of its hypothetical moon below. More study is needed to confirm this system. 51 Pegasi was the first star similar to our Sun found to have a planet orbiting around it. This world was announced in 1995 by Michael Mayor and Didier Queloz of the Geneva Observatory in Switzerland. Discovered in 1997 by Noyes, et al, of SAO and NCAR this planet of 1.04 Jupiter masses has a 39.85-day orbit around a sun-like star. It is located in the constellation Corona Borealis. This large planet of 11 Jupiter masses (sometimes classified as a brown dwarf) was discovered by David Latham and his colleagues at CfA. It orbits a yellowish main- sequence star which lies in the constellation Coma Berenices. The orbit is 84 days long.